Today, I’ve invited Linda Boulanger to visit me in my virtual living room, to talk about her latest book Becoming, which is a collection of inspirational, faith-based short-short stories. Becoming starts with a story about a young woman whose father bails her out of jail, which will inevitably have political repercussions for him. The story is called “A Ready Heart.” It’s actually one of my favorites. I’ve been asked multiple times by individuals if they can use the story with their youth groups, this one and “Sweet Success for My Teen & Me,” which is also in the book. I believe it is because the story clearly focuses not on the fact that we make mistakes, but more so on what we do with the lessons learned from those mistakes. Beyond that, how others help us move away from them, as well, can make a world of difference. Darcy Adams, the main character, seems to be a magnet for trouble. Her dad, a prominent attorney in the city, could have chosen to publicly berate his daughter, as did the parents of her best friend and cohort in crime. After all, he would undoubtedly be slammed in the media and his credibility questioned for having an out-of-control daughter. He knows, however, that there is good inside of his daughter, and continues to believe for her until her heart is ready to accept the wonderful plans God has in store for her life. He doesn’t give up on her, allowing her the time she needs to not give up on herself either. What inspired you to write Becoming? The gentleman that deserves the credit for my first publishing success literally backed me into a corner and forced me to begin a weekly writing challenge on a site called FaithWriters.com. Okay, so he didn’t do it literally, as he lives in Colorado and I am in Oklahoma. Still, he continuously harped until I relented. My first story entered—not coincidentally part of Becoming— The first story I entered, “Dark Chocolate,” won a second place in the Beginners Level. I was ecstatic, to say the least. I pasted my success all over my Facebook page, my only means of social marketing at the time, his Facebook page, the pages of all my friends, called and emailed everyone I knew. I was excited! The win, however, forced me to move up a level and my next story, while placing well in the top 40, did not win one of the 3 top spots. The next story after that, the one that begins the book Becoming, did, and moved me up to the Advanced Level. It would take me two more weekly challenge tries with stories again placing well but not in the top 3, before I “hit it big” with “Unwanted”, an emotion-packed story that allows the reader inside the head of the main character to see the wounds of betrayal heal when she is forced to become the caretaker of a child born of her husband’s infidelity. The story not only won a first place, it received an Editor’s Choice award and I was asked to allow it to be published. 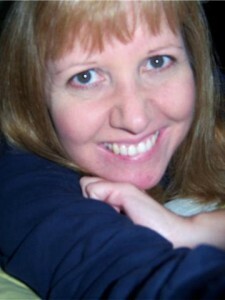 So Becoming grew out of stories you had written for FaithWriters.com. Well, that gentleman is Patrick Sipperly. We co-wrote Time Out on a Roller Coaster, a collection of light and fun short stories. Pat and I went to high school together in the ’80’s—I’ll date myself here—only to reconnect on Facebook many years later. An aspiring screenwriter himself, one day as we chatted he asked me what I wanted to do. I told him my dream was to hold a book in my hands with my name on the cover. His reply: “Let’s do it.” Four months later, we had our book, a book that I wanted but probably would not have had without a little friendly handholding. That’s why encouragement is so very important. It can make dreams come true. Pat and I were brainstorming for another collection of short stories. We wanted them to be more faith-based than those in Roller Coaster. I pulled together everything even remotely faith-based that I’d written to date and sent them to him. “What about any of these?” I asked. His reply: “You’ve got a book right there.” He was right, and they were stories I really wanted to share. I began compiling and, as he noted, many of them had common themes beyond faith. They deal with different phases of life and with personal transformation. That became the theme for Becoming. Right. The stories are laid out and written in a way to make the reader feel as if she is walking through life, from the young lady in the story that begins the book, clear through to one of the last stories that has a husband writing a “love note” to his wife, reminding her not to be sad at his funeral. The book touches many subjects along the path of life. Some are hard, as in “When Lines Are Crossed,” when the main character realizes she’s very nearly crossed the lines of infidelity, not in body but in the cyber world. Others are fun, like “A Woman of a Certain Age” that portrays the humorous transformation of the aging woman. I love romance so many of them have the theme of love in some way. My overall desire was to create a book that would allow the reader to escape into a fictional world for brief periods of time, yet be overall uplifting as well. And while they are all faith-based, I would not consider any of them to be preachy. What’s your favorite story in the book? This is an extremely difficult question because I fall in love and feel a connect of some sort with every single character I create. I’ll go out on a limb here and choose “His Blood For Yours.” This story received mixed reviews. I was told the writing was flawless, the main character marvelous, and the story spiritually challenging. The overall gist of the story is: a surgeon stumbles upon a crime scene, and she saves a man on the spot, who ends up being the gunman that shot several people. He tells her when she visits him in the hospital that he’s not a bad man but had a bad day. That line hit a nerve with people. I was told he was a bad man! What I’d hoped to show was that people often do things when run by emotion. The doctor shares real compassion with him and gives him hope. She shares with him about the Great Physician whose blood still cleans the stains from all of our bad days. She ministers to him throughout the story. I like it! That sounds like a story I could fall in love with and see myself writing. I haven’t read the story yet, but it could even be that readers reacted negatively, because the story challenged them to identify in part with the villain. Could we expand that question to “projects”?! Just kidding. However, I never seem able to work on just one thing. My “biggie” is my first published novel. Notice I said “first published” as I have a slew of manuscripts that were handwritten and are currently being transformed into properly formatted electronic versions. The first born to see the world, however, is nearing first-draft completion. Titled A Marriage of Necessity, it is a modern-day coming-together of a man and woman, each merely needing the help of the other. As their hearts begin to connect, the threads are threatened by the doubts put into the head of the heroine, Terry, by a scheming ex-husband. Added fears are compounded when she begins to feel ill and suspects foul play by her new husband’s eldest daughter, a child who clearly does not want her as part of their family. While I am working on A Marriage of Necessity, I’m having other manuscripts typed up, having my second children’s book illustrated, and working to finish up two others, keeping my blog updated, editing and formatting for others, continuing weekly writing challenges (though not necessarily every week), and I’ve started writing yet another book while jotting ideas down about a third one. I fit all this in between being wife and mother of 4 busy children and volunteering at my local no-kill animal shelter. Life is busy! I have actually tried to concentrate on a single project; however, I feel it stifles my creativity, and I actually get it done much more slowly. You mentioned Facebook, Twitter, and so forth. Maybe I should list those web addresses. Yes. As the owner of One Stop Publisher, an internet company designed to help others reach the dream of a hold-in-your-hand book without breaking the bank, I’m continually learning the importance of social marketing and networking. I encourage others, and have done so myself, to establish web presence. Author and book marketer Lori Newman told me the first thing she was asked when trying to pitch her book was how she planned to market it. That lets you know, authors are expected to do a lot of it themselves. True. That’s a myth many new authors and non-authors hold, that the publisher markets the book for you. They usually don’t. Thanks so much for taking the time to chat with us, Linda. 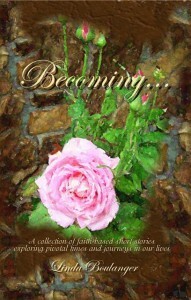 Be sure to check out Becoming as well as Linda’s other books, and subscribe to her blog and other feeds.